Entrepreneurs carry the world on their shoulders. Product inception, development, launch, placement, pricing and market fit have to be just right for the success of the company. 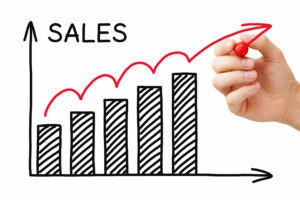 Winning sales is paramount, and selling emerging products is hard, even for sales people. If sales instincts aren’t coursing through your veins, you may benefit from these 6 sales leadership insights. 1. Never underestimate the customer sales cycle. A sales cycle is the amount of time that passes from first contact with a potential customer to placement of purchase order. Getting in the door may be the most challenging. Or navigating a lengthy approval process could extend time to revenue. In big box retail, missing a planogram set or negotiating a complicated contract may delay revenue 3 months, even after getting to “yes”. I don’t care how great you think your product is. When building your business plan, bank on no less than 6 months and up to 18+ months for each sales cycle. If you close a deal more quickly (we call this a “blue bird”), put the money in the bank and get back to your long term selling. 2. Don’t underrate the cost of entry and business sustainability when setting customer price and programs. Head into each customer opportunity with eyes wide open about the true costs of doing business. If you go into any sales engagement with slim or negative unit economics, you won’t make it up in volume 🙂 In fact, volume and high top line sales could be your worst enemy. At last year’s Launch Scale conference, Jason Demant (founder of Bento) illustrated in detail the detrimental impact selling at a loss has on a business. Since, Jason’s sage words, “Never scale with negative unit economics”, have flowed from my lips to founders. Calculate every expense (manufacturing cost to customer margins to channel marketing programs) in a comprehensive pricing/program model. If the contribution margin is negative, you’d better have a damn good reason to move forward with the business (generally not recommended). 3. Don’t wait to hire Sales leadership. The CEO is viewed as the #1 salesperson for her company. When it comes to doing actual sales, it pays to bring someone on board 6+ months before product launch (see #1 – sales cycle). The benefit you receive from the wisdom of a sales professional who’s been there, done that will pay you back in spades. A great sales leader will help you design the framework for a sustainable and successful business, get you in the customer’s door, and avoid pitfalls you wouldn’t even see coming. Bootstrapping? If you can’t afford a full-time VP of Sales now, consider a consultant with an outstanding reputation. 4. Never give up a direct and continual connection with your customer. People buy products from people. An authentic, trusted relationship has always worked to the advantage of a company’s sales efforts. The startup founder’s continuous connection to the customer can aid in developing a deeper relationship. I recently asked Rory O’Driscoll of Scale Venture Partners to share a piece of sales advice he wished he had received in the early days of entrepreneurship, and he offered the perspective that the executive-to-customer connection needs to be strong. Regular face time with your customers and prospects not only gives them a feeling of connection to the heart of your company, it also gives you a direct link to what matters most for the continued sales success of your business. 5. Be realistic about your product’s time to market. Product schedules slip, even for the biggest of brands. Your ability to deliver on your commitments affects every future sales engagement with a customer. Once you’ve gotten the customer to commit, don’t jeopardize it by shipping late. Your communicated launch date should always include a buffer. 6. Focus on sell-through rather than sell-in. Startups that oversell and tie too much capital up in excess inventory are in trouble. Stale inventory is a serious liability, as it prevents recurring revenue and puts your company at risk for a large return. A forecast and financial plan built on sell-through (units sold from reseller/retailer to their customer) versus sell-in (units shipped from you to the reseller) is far more predictable, minimizes financial risk, and enables on-going revenue. You don’t have to be an expert at sales to get it right. Make wise financial decisions on customer engagements, stay involved, and bring in reinforcements. Suzanne Oehler is an energetic, driven business leader with 15 years in consumer and enterprise tech Sales. Widely regarded for opening and expanding business in brick-and-mortar Retail and digital E-Commerce for consumer technology hardware start-ups, she designs and implements winning Sales strategies that navigate the complexities of Consumer markets.